“Double-crested reptile”, was discovered in 1942 in Monument Valley in the Navajo country, Arizona, by native Jesse Williams. Based on these remains, which came from the Kayenta Formation, it was described in 1954 by Sam Welles as a new species of Megalosaurus, before new remains revealed it was a new animal. Welles gave it a new description, and name, in 1970. Dilophosaurus lived during the Hettangian or Sinemurian stages of the Early Jurassic, about 200 to 190 million years ago. It was 6 meters (20ft) in length, over 1.8 meters (6ft) in height at the hips and 1000 pounds (454kg) in weight. It belonged to the Dilophosauridae, a group of medium-sized early theropods that also included Cryolophosaurus, Dracovenator, and Zupaysaurus. Material for Dilophosaurus includes a number of specimens of varying degrees of completeness and ages, ranging from scattered fragments of an infant, to the incomplete subadult holotype specimen, to an incomplete adult specimen which was the first to preserve the distinctive crests, and more. The large crests for which it was famous may have been used for sexual display or intraspecific recognition, and would have been brightly colored. Several specimens have been discovered together and have been interpreted as evidence of group behavior, though this has been contested by other researches, leaving it open to debate. In addition, resting traces attributed to Dilophosaurus have been used to shed light on dinosaur posture, and track types from the Kayenta Formation have been attributed to Dilophosaurus. Unlike how it is depicted in Jurassic Park, there is no evidence to suggest that the real animal had any poison-spitting abilities or was venomous at all. Dilophosaurus is witnessed in Jurassic Park on multiple occasions; they were first seen in one of the chapters of “Control” by the tour group, and Robert Muldoon cited them as the reason that the jungle river ride was delayed. The Dilophosaurus were situated along the jungle river just north of the Hypsilophodon, to the left and below the tour road; they are described as being “ten-feet-tall and spotted yellow and black like a leopard,” with “two broad curving crests that made a V shape above its head;” the crests were decorated with “red and black stripes,” and they may a “soft hooting cry, like an owl.” It is here that Dilophosaurus‘ distinguishing characteristic is introduced: Jurassic Park’s Dilophosaurus were venomous, having a “hemotoxic venom similar to rattlesnakes secreted from gland in the mouth;” their bite quickly resulting in unconsciousness, and allowed the dilophosaur to hunt at its leisure. Muldoon later elaborates on the issues caused by the Dilophosaurus. The dinosaur’s venomous qualities were only realized after they were observed hunting rats, and only learned that they could spit their venom–at a maximum distance of 15.2 m (50 ft)–after one nearly blinded a handler. Park scientists tried twice to remove the venom glands from the animals, but they could not locate the glands without performing an autopsy, and the management refused to euthanize one to find out. As Dennis Nedry makes his trip to deliver the embryos that Lewis Dodgson wanted, he found himself at the jungle river. While there, he left his jeep to try to find out where he was and was blinded, killed, and partially eaten by one of the Dilophosaurus. Later on, while Muldoon, Ramón, Carlos, and other workers were fixing one of the cutouts near the Jungle River, they heard the Dilophosaurus‘ distinctive cries in the distance, prompting Muldoon to tell the workers to hurry up. They are seen one last time by Alan Grant, Tim and Lex Murphy as they sailed down the river. The specimens seen here exhibit signs of sexual dimorphism; one was “smaller, and duller,” and they were performing a courtship ritual on the banks of the river. The ritual involved a pair of Dilophosaurus that would take turns repeatedly drinking water and hooting at each other. 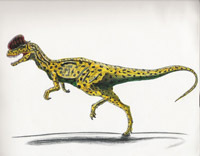 The Dilophosaurus did not have RANA fragments in their genome–they had not been spliced with frog DNA–and as such were not breeding animals. This is confirmed by the control room population tables: as expected, the Dilophosaurus had an exact population of seven, but their numbers reduced to four as the park’s species reached an equilibrium. Their last recorded version number was 4.3.